Replacement crews work on a natural gas line on Wyman Street in Woburn after a surge in pressure led officials to cut off service to 300 homes. Locked out National Grid workers used the opportunity to picket the work site. It’s shaping up to be a chilly winter for Greater Boston’s development community. Trade group NAIOP Massachusetts has been pushing the Baker administration for help with the state moratorium on natural gas hookups in National Grid’s territory. The stoppage and a months-long labor dispute have delayed the completion of offices, apartments, and single-family homes. The word back from the administration: We hear you, but we’re not ready to ease the restrictions just yet. Matt Beaton, Governor Charlie Baker’s energy secretary, sent a letter last week to NAIOP Massachusetts and the Home Builders Association of Massachusetts after he met with representatives for both groups. For now, only emergency and compliance work is being allowed. That includes metering work for already-occupied buildings. Beaton recognizes the economic toll. The state Department of Public Utilities, he said, will consider additional types of work that can be done when the agency is confident of their safety. With winter approaching, many builders and developers are turning to pricey stopgap measures such as diesel generators and propane tanks. Even with unfinished projects, they need heat to protect interiors and to keep pipes from freezing — including those that feed sprinkler systems. It’s not just luxury condos and fancy offices that are held up. The Acadia, the Neighborhood Developers’ 34-unit affordable housing complex in Chelsea, is done and tenants are selected. But they can’t move in without gas. (Space heaters are being used to protect the interior finishes.) Several other affordable apartment projects are in a similar situation. NAIOP’s Tamara Small estimates that thousands of housing units, including hundreds of affordable ones, are delayed. Some employers can’t move into their new offices, she said, and some restaurants and hotels can’t open their doors. When state officials imposed the moratorium on Oct. 8, it was hard to blame them for their caution. The explosions and fires in the Merrimack Valley took place in Columbia Gas territory, but they put the entire industry on high alert. The DPU had already cited National Grid for safety issues. 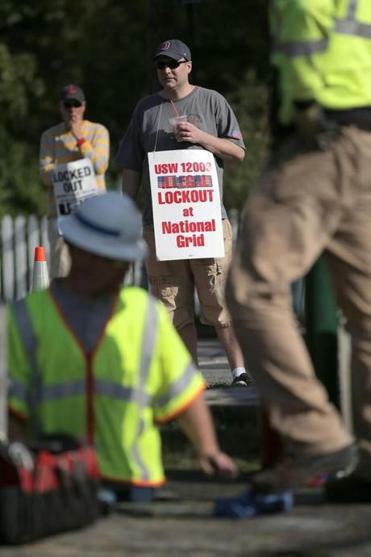 Union steelworkers, locked out of their jobs by National Grid since June, peppered the agency with safety complaints. Then, there was an accidental over-pressurization of gas in Woburn, part of National Grid’s territory. No one was hurt. But it was the last straw. Since the moratorium began, the DPU has approved only three emergency work projects in National Grid’s area. Resolving the lockout could prove to be the bigger issue and the tougher challenge. Negotiators for National Grid and the steelworkers return to the bargaining table on Thursday to discuss a counter-proposal from union reps. A spokeswoman says National Grid wants an agreement by Christmas, but the union offer doesn’t address the company’s core issues around health insurance and new-hire retirement plans. State officials say gas connections were added at roughly half the typical pace over the summer, under National Grid’s replacement crews. The backlog went from bad to worse, and it’s much harder to excavate in the winter. Even when the Baker administration finally lifts its moratorium, developers could still face a long wait before it’s their turn to be connected.